Hey, look, it is Antarctica! During our two days at the Adellie Site, the spirits of Antarctica granted us the glory of seeing the magnificence of this most remote continent. For days before, we had cloudy damp weather that often cast a pale grey on both sky and sea, event with the sun newly risen, one tried in vain to pierce through the horizontal misty air that seem to merge the sky to the sea with a grayish cloud that would confuse one in where the true horizon was. Hence as we traveled south toward this site, optimism was low that we would be able to spy the mysterious land that we have been studying and trying to understand as this was the noble purpose for this expedition. As we worked through the late night and waited for the sunrise in hope of spying some of the large pieces of ice that had calved from the ice sheet on land, the sky remained murky. After I had finished the webcast to the schools back in the US, I went outside to gaze at the sea. There were several icebergs. The sky was still gray and it was a bit cold, but before I gave up and went inside, a little voice was heard on the wind for me to walk over to the other side and see if there were any other icebergs. I walked around on the deck above as the bow was closed. As I rounded the bend, I saw on the other side of the ship the sky was breaking up with large tracts of blue sky stretching from down the horizon. Clear royal blue of such brilliance that let the low lying Antarctic sun now reached its golden rays alighting the landscape that laid out before me. I stood there, l as if on heavenly ground gazing out to the most of holy sites that an Antarctic scientist could set their eyes on. There before me laid a mere 20 km or so was the Antarctic continent stretching out in all directions and as far as the eye could see from one side of the horizon to the next. An immense ice sheet covered the land, with its whiteness rising quickly from the coastline reaching higher and higher until it vanished in the distance. While some of this rising plateau seemed benign and one could imagine almost gliding down these inclines on skis or some other form of recreational plaything, other areas contained large gashes on its side. Dark black lines that even at this distance could only represent enormous crevices that plagued large portions of the ice sheet’s face, providing a reminder that this is a treacherous and dangerous place. Even though this continent laid in the far distance, one could see that they would be monstrous large if near them. Perhaps miles long with openings that would swallow large buildings, in the distance they provided a mean to understand the slope of this rising edifice of solid blue ice that within our sight was probably 1,000’s of feet thick. 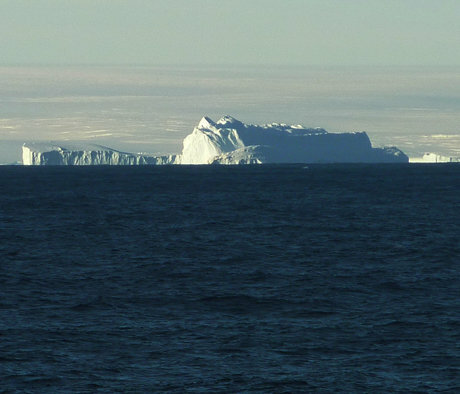 To round out this glorious site was the large flotilla of towering icebergs that laid between the continent and us. I had never approached the continent from the sea, always by air. While the continent is beautiful from the air, it is remote and being in a plane separates one from the environment of this frozen continent. Here on the deck, I felt the cold wind coming off the icy slope of this continent freshening my cheeks and touching my spirit. This enchanting place has touched my soul like no other place. And this time, I was able to come up upon it slowly and majestically like slowly walking up to a holy site, taking in all of its details of floating icebergs as big as towns looming up high above the sea, casting a foreground or perhaps a prelude of musical sights to the main event that looms behind them. Seeing this great expanse of white, I was able to take in how this place can affect the global climate and global sea level. “God, if this ever melted”, was my murmurings as my heart sighed at this precious vista. The deck was filled with wary night shifter, having worked through the evening, now to be rewarded by the view that touched everyone’s hearts. Then to make it just perfect, the sun began to warm the deck and our cold bodies. My black leather jacket hungrily took in the sun’s golden rays warming by back and allowing me to continue enjoying this spectacle. Although low in the sky, the sun is up for much of the day and her gilding her beams of radiant energy, the spirits of Antarctica’s cold would be much maligned and would bemoan in envy that the sun so low in the sky can produce such results, ”this is the realm of cold and ice and the sun and her legion of warm golden rays has no place here”. But the sun is unrelenting and warring against her is a most futile ambition.